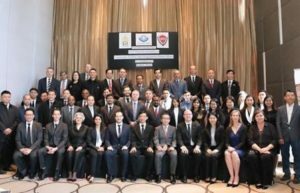 The Regional Workshop on Passenger Controls and Programme Global Shield was held from 16 to 18 October 2017 in Bangkok, Thailand as part of the WCO Security Project for South East Asia and the Pacific Islands. The event was organized by the WCO and co-hosted by the Thai Customs Department. The WCO Security Project, funded by the Government of Japan, aims to support Member administrations in South East Asia and surrounding countries in their efforts to enhance security against the threat of terrorist attacks. The objectives of the Workshop were to: (i) raise awareness amongst Customs administrations of the threat posed by improvised explosive devices (IEDs), and of the cross-border movement of Foreign Terrorist Fighters (FTFs) and other individuals supporting terrorism; (ii) discuss requirements for training in inspection techniques, risk management and investigations; (iii) and provide a platform for delegates from the Asia/Pacific (A/P) region to share experiences and discuss best practices relating to both initiatives. Delegates from 22 Members in the A/P region and representatives from the WCO Secretariat, INTERPOL, the International Air Transport Association (IATA), the International Civil Aviation Organization (ICAO), the UK Border Force and US Customs and Border Protection participated in the Workshop, which was opened with a speech by Mr. Chaiyut Kumkun, the Deputy Director General of the Thai Customs Department. The WCO Secretariat provided updates on the WCO Security Project’s initiatives, and shared information on planned training, technology deployment and operational activities. INTERPOL’s briefing set the scene in relation to the threat posed by IEDs and FTFs, while Japan Customs explained how new technologies can help Customs face the threat posed by chemical precursors used in the manufacture of IEDs. IATA and ICAO described the regulatory framework for using Advance Passenger Information (API) and Passenger Name Record (PNR) for passenger risk assessment, and a number of participants shared their experience in implementing API and PNR systems.